The story the Red Riding Hood revolves around a girl named after the red hooded cape/cloak (in Perrault’s fairytale) or a simple cap (in the Grimms’ version called Little Red-Cap) she wears. On her way to visit her sick grandmother, she is approached by the wolf, naively tells him where she is going and then get distracted by picking flowers as the wolf suggested. It gives him time to go to the grandmother’s house, deceive her to get in, and eat her whole, (in some stories, he locks her in the closet). He then waits for the girl, disguised as the grandma. These are the famous lines that probably everyone can associate with the Red Riding Hood when she finally reaches her grandmother, but is met by the wolf in disguise: “What a deep voice you have,” (“The better to greet you with”), “Goodness, what big eyes you have,” (“The better to see you with”) “And what big hands you have!” (“The better to hug/grab you with”), and lastly, “What a big mouth you have,” (“The better to eat you with!”) at which point the wolf jumps out of bed, and swallows her up too. Then he falls fast asleep. A lumberjack/hunter comes to the rescue and with his axe cuts open the wolf that had fallen asleep. Little Red Riding Hood and her grandmother come out unharmed. As revenge, they fill the wolf’s body with heavy stones, thus when he awakens and tries to flee, the stones cause him to collapse and die. 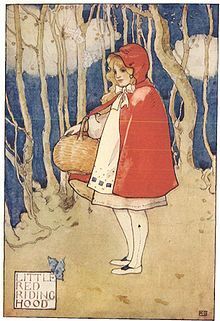 The origins of the Little Red Riding Hood story can be traced to versions from various European countries and more than likely preceding the 17th century, of which several exist, some significantly different from the currently known, Grimms-inspired version. It was told by French peasants in the 10th century. In Italy, the Little Red Riding Hood was told by peasants in 14th century, where a number of versions exist, including La finta nonna (The False Grandmother). It has also been called “The Story of Grandmother”. It is also possible that this early tale has roots in very similar Oriental tales (e.g. “Grandaunt Tiger”). These early variations of the tale differ from the currently known version in several ways. The antagonist is not always a wolf, but sometimes an ogre or a ‘bzou’ (werewolf), making these tales relevant to the werewolf-trials (similar to witch trials) of the time (e.g. the trial of Peter Stumpp and if you want to shudder in horror, research Peter Stumpp at your own risk, that’s one scary story). The wolf usually leaves the grandmother’s blood and meat for the girl to eat, who then unwittingly cannibalizes her own grandmother. Furthermore, the wolf was also known to ask her to remove her clothing and toss it into the fire. In some versions, the wolf eats the girl after she gets into bed with him, and the story ends there. In others, she sees through his disguise and tries to escape, complaining to her “grandmother” that she needs to defecate and would not wish to do so in the bed. The wolf reluctantly lets her go, tied to a piece of string so she does not get away. However, the girl slips the string over something else and runs off. In these stories she escapes with no help from any male or older female figure, instead using her own cunning. Sometimes, though more rarely, the red hood is even non-existent. Charles Perrault was a French author in the 17th century. He laid the foundations for a new literary genre, the fairy tale, with his works derived from pre-existing folk tales. The best known of his tales include ʼLe Petit Chaperon rougeʼ (Little Red Riding Hood), ʼCendrillonʼ (Cinderella), ʼLe Chat Bottéʼ (Puss in Boots) and ʼLa Barbe bleueʼ (Bluebeard). Many of Perrault’s stories were rewritten by the Brothers Grimm, continue to be printed and have been adapted to opera, ballet (such as Tchaikovsky’s The Sleeping Beauty), theatre, and film (Disney). The story had as its subject an “attractive, well-bred young lady”, a village girl of the country being deceived into giving a wolf she encountered the information he needed to find her grandmother’s and eat the old woman while at the same time avoiding being noticed by woodcutters. Then he proceeded to lay a trap for the Red Riding Hood who ends up being asked to climb into the bed before being eaten by the wolf, where the story ends. The wolf emerges the victor of the encounter and there is no happy ending. From this story one learns that children, especially young lasses, pretty, courteous and well-bred, do very wrong to listen to strangers, And it is not an unheard thing if the Wolf is thereby provided with his dinner. I say Wolf, for all wolves are not of the same sort; there is one kind with an amenable disposition – neither noisy, nor hateful, nor angry, but tame, obliging and gentle, following the young maids in the streets, even into their homes. Alas! Who does not know that these gentle wolves are of all such creatures the most dangerous! Tell me, does that remind you of the early warnings about pedophiles? In the 19th century the Brothers Grimm fashioned their own variant, Little Red-Cap, from two versions they had been told. The earlier parts of the tale agree so closely with Perrault’s variant that it is almost certainly the source of the tale. However, they modified the ending; this version had the little girl and her grandmother saved by a huntsman who was after the wolf’s skin; this ending is identical to that in the tale The Wolf and the Seven Young Kids, which appears to be the source. The Brothers further revised the story in later editions and it reached the above mentioned final and better known version in the 1857 edition of their work. It is notably tamer than the older stories which contained darker themes. Numerous authors have rewritten or adapted this tale. There’s one that caught my attention the most. In the 20th century many new versions were written and produced, especially in the wake of Freudian analysis, deconstruction and feminist critical theory. 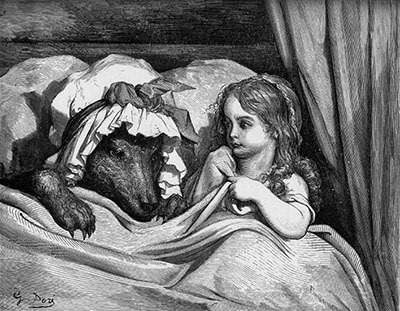 Folklorists and cultural anthropologists such as P. Saintyves and Edward Burnett Tylor saw “Little Red Riding Hood” in terms of solar myths and other naturally-occurring cycles. Her red hood could represent the bright sun which is ultimately swallowed by the terrible night (the wolf), and the variations in which she is cut out of the wolf’s belly represent by it the dawn. In this interpretation, there is a connection between the wolf of this tale and Sköll, the wolf in Norse myth that will swallow the personified Sun at Ragnarök, or Fenrir. Alternatively, the tale could be about the season of spring, or the month of May, escaping the winter. The tale has been interpreted as a puberty ritual, stemming from a prehistorical origin (sometimes an origin stemming from a previous matriarchal era). The girl, leaving home, enters a liminal state and by going through the acts of the tale, is transformed into an adult woman by the act of coming out of the wolf’s belly. Bruno Bettelheim, in The Uses of Enchantment, recast the Little Red Riding Hood motif in terms of classic Freudian analysis that shows how fairy tales educate, support, and liberate the emotions of children. The motif of the huntsman cutting open the wolf, he interpreted as a “rebirth”; the girl who foolishly listened to the wolf has been reborn as a new person. Red Riding Hood has also been seen as a parable of sexual maturity. In this interpretation, the red cloak symbolizes the blood of menstruation, braving the “dark forest” of womanhood. Or the cloak could symbolize the hymen (earlier versions of the tale generally do not state that the cloak is red). In this case, the wolf threatens the girl’s virginity. The anthropomorphic wolf symbolizes a man, who could be a lover, seducer or sexual predator. This differs from the ritual explanation in that the entry into adulthood is biologically, not socially, determined. There have been many modern uses and adaptations of Little Red Riding Hood. The tale can be told in terms of Little Red Riding Hood’s sexual attractiveness. The song “How Could Red Riding Hood (Have Been So Very Good)?” by A.P. Randolph in 1925 was the first song known to be banned from radio because of its sexual suggestiveness. The 1966 hit song “Lil’ Red Riding Hood” by Sam the Sham & the Pharaohs takes the Wolf’s point of view, implying that he wants love rather than blood. The story may also serve as a metaphor for a sexual awakening, as in Angela Carter’s story “The Company of Wolves”, published in her collection The Bloody Chamber (1979). (Carter’s story was adapted into a film by Neil Jordan in 1984.) In the story, the wolf is in fact a werewolf, and comes to newly-menstruating Red Riding Hood in the forest in the form of a charming hunter. He turns into a wolf and eats her grandmother, and is about to devour her as well, when she is equally seductive and ends up lying with the wolf man, her sexual awakening. Such tellings bear some similarity to the “animal bridegroom” tales, such as Beauty and the Beast or The Frog Prince, but where the heroines of those tales transform the hero into a prince, whereas these tellings of Little Red Riding Hood reveal to the heroine that she has a wild nature like the hero’s. Little Red Riding Hood is also one of the central characters in the 1987 Broadway musical Into the Woods by Stephen Sondheim and James Lapine. In the song, “I Know Things Now” she speaks of how the wolf made her feel “excited, well, excited and scared,” in a reference to the sexual undertones of their relationship. Red Riding Hood’s cape is also one of the musical’s four quest items that are emblematic of fairy tales. Publishers like BlueQuoll, an Australian publishing group, have pushed further the boundaries of the narration and re-invented the story even in the title, Mr. Wolf and the Ginger Cupcakes that puts the wolf at the center of the narration. In their version the element of good vs evil is removed from the story and the wolf is not portrayed as a negative character that deserves to die miserably at the end of the story. A recent adaptation of Little Red Riding Hood has been seen in the ABC new hit series Once Upon a Time (spoilers for those still to watch the show). In this version, Little Red Riding Hood goes by ‘Red’ and she is no innocent little girl. Red is given a mature, fiery attitude but lives with her grandmother because she was told her parents were killed in a hunting accident. As the story elaborates, we find out Red is actually the wolf that threatens the forest and if she does not keep her magic, red cloak on she turns into the wolf on the night of a full moon. Later, Red finds her mother, who is in fact not dead, but part wolf as well, and is the leader of a group of other half-wolf people who have learned to embrace the wolf inside them instead of fear it. Her mother teaches Red to embrace the wolf as well, and Red learns to accept who she is instead of seeing herself as a monster. As you’ve read, Little Red Riding Hood has been a very popular fairytale to be retold. The most common variations were those of moral warning and those with sexual connotations. I, too, have played with the theme of the Red Riding Hood in one of my short stories, with a twist where the Red is the antagonist, and the Werewolf was saved by the Hunters, turning it more into a supernatural story. I hope it will find a home in some anthology or a genre themed magazine, so you’ll have the opportunity to read it soon. In the end, what are your thoughts on the Little Red?